Phoenix, AZ (7/3/18) - The lingering dry conditions and lack of moisture means more Stage II Fire Restrictions will go into place on Arizona state-owned and managed lands. 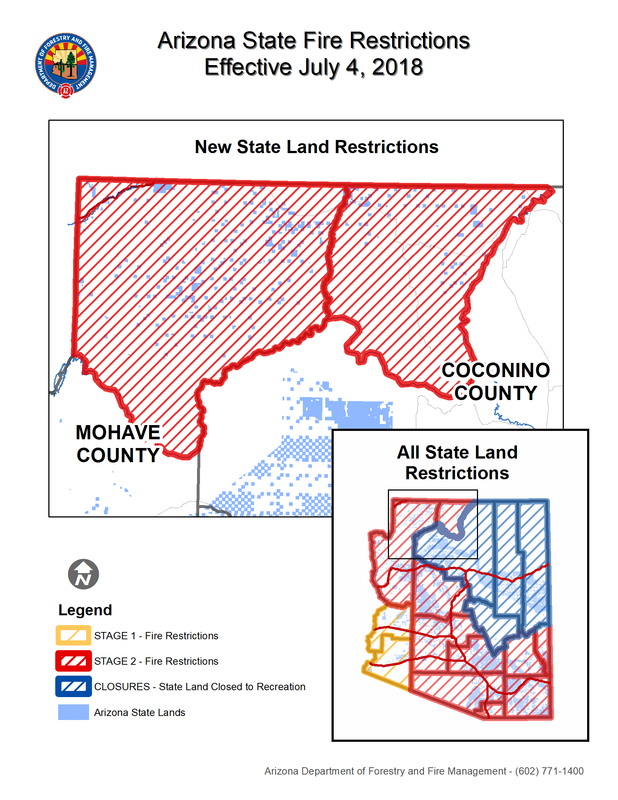 At 0800, on Wednesday, July 4th, the Arizona Department of Forestry and Fire Management will implement those restrictions, which include, no campfires, to state lands within Coconino and Mohave counties, north of the Grand Canyon. The Stage II restrictions also mean DFFM’s Industrial Plan C is in effect, to include, restrictions on time of use for chainsaws, mechanical fellers, masticators and chippers, and a fire guard must be in place for industrial activities. As a reminder, state-owned and managed lands in Coconino County, south of the Grand Canyon, remain closed to recreation. “Even with the recent moisture a few weeks back, we are still in just as bad of shape as we were months ago. Anything we can do to reduce the risk of an explosive wildfire, we must act on to protect our Arizona residents and our first responders,” said State Forester Jeff Whitney. All Game and Fish Commission Wildlife areas and department properties outside incorporated municipalities. All State Parks outside incorporated municipalities – State Parks do have fire restrictions in place. Please refer to https://azstateparks.com/arizona-state-park-fire-restrictions-and-info – for park-specific fire restriction information. All Department of Transportation highway, right-of-way property outside incorporated municipalities, not owned by federal land management agencies. No campfires. Building, maintaining, attending, or using a fire, campfire, charcoal, coal fire, or wood stove, including in developed campgrounds or improved sites is prohibited. No chainsaw use from 9am – 8pm. Discharging a firearm, air rifle or gun gas, unless while engaged in a lawful hunt pursuant to state, federal, or tribal laws and regulations is prohibited. Fireworks or another incendiary device are prohibited. Mechanical and industrial prohibitions include, operating any internal combustion engine, welding or operating acetylene or other torch with an open flame, and using an explosive. Industrial operations where specific operations and exemptions are identified and mitigation measures are implemented as outline in an agency plan. Persons using a device fueled by liquid petroleum or LPG fuels that can be turned on and off is permitted. Such devices can only be used in an area that is barren or clear of all overhead and surrounding flammable materials within three feet of the device. Operating generators with an approved spark arresting device within an enclosed vehicle or building, or in an area that is barren or cleared of all overhead and surrounding flammable materials with three feet of the generator. Operating motorized vehicles on designated roads and you must park in an area devoid of vegetation within 10 feet of the roadway. Any federal, state or local law enforcement officer, or member of an organized rescue or firefighting organization, or other authorized personnel in the performance of an official duty. All land within a city boundary is exempted unless otherwise stated in a city ordinance. Discharging of firearms is allowed on agency designated shooting ranges. All exemptions to these restrictions must be approved by the State Forester. If local authorities have imposed stronger restrictions then those listed above, than the local restrictions shall apply. These restrictions apply to all permit and lease holders and other authorized users of state-managed lands. These restrictions do not apply to private lands under ARS § 37-1303. Restrictions are effective at 0800 on Wednesday, July 4th and will continue until rescinded.